Keep your students prepared with an app designed for career readiness. Meet your students where they are with digitized event programming. 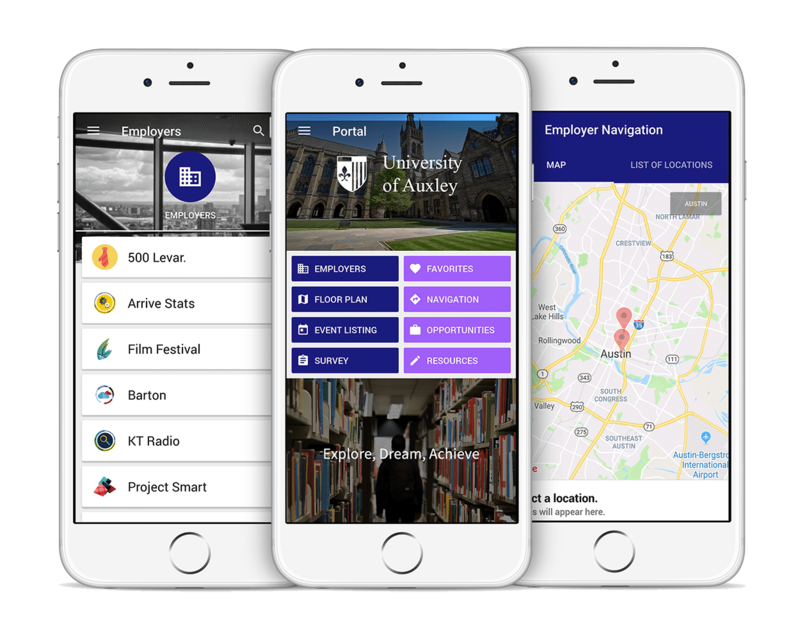 Increase exposure to resources at your career center with a mobile interface. 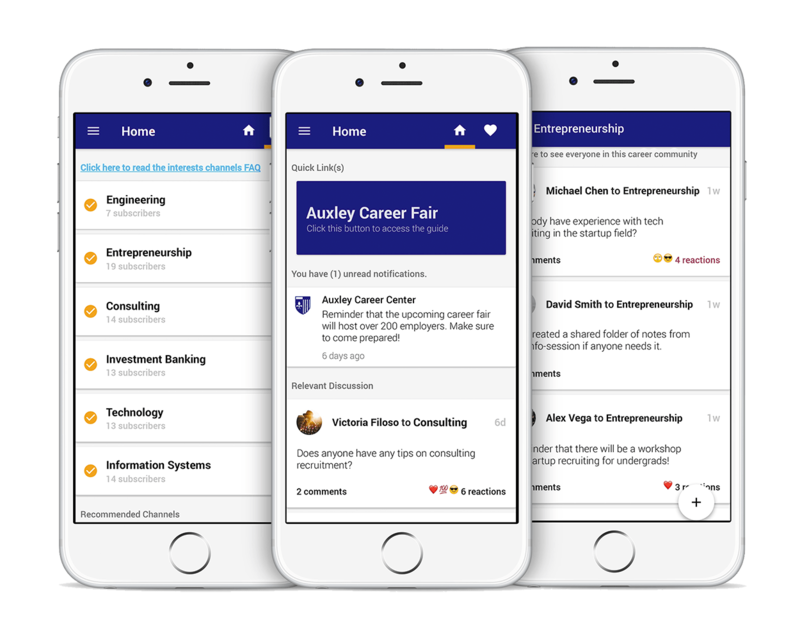 Utilize modern social capabilities to nurture interest in career topics with in-app career communities. Ensure that communications between you and your students stay relevant and effective. Career Fairs. Workshops. Interest Sessions. Meet students where they are by distributing event info through an app. A mobile home for your event programming goes beyond just paper cost savings. Students today can’t be bothered with physical booklets and flyers. A mobile interface for your events guarantees higher engagement and ultimately ensures that your students are well informed. Career centers offer so many amenities to drive career readiness. Unfortunately, a lot of these resources don’t get the exposure they need and end up underutilized. Oftentimes students may not even know of these resources throughout their years in college. Fix this by sharing your resources through a mobile interface. Effectively communicate opportunities and tips to the right students. Every student body is comprised of a unique and diverse set of students. It makes sense that they’ll be interested in a variety of career paths whether it be in research, entrepreneurship, or engineering. 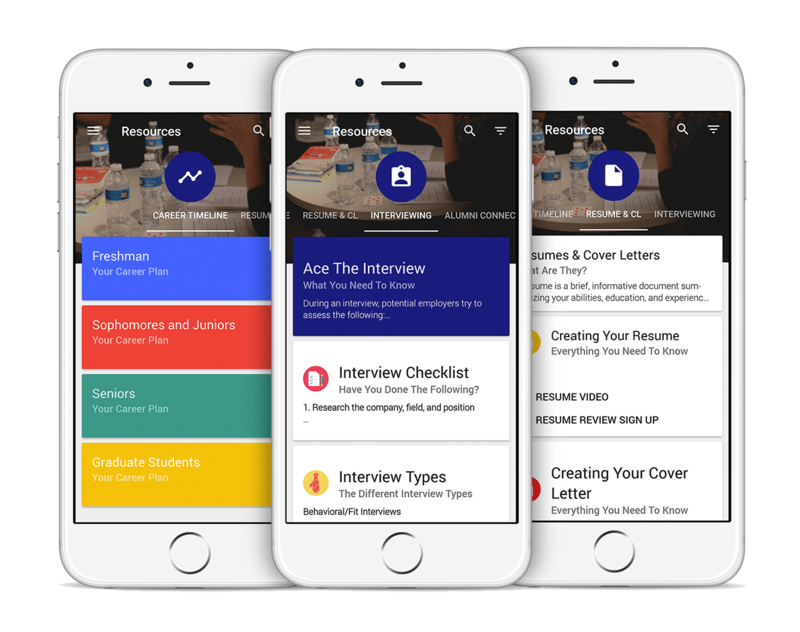 Powered with career profiles, targeted notifications, and student group capabilities, the Career Engagement App gives you the ability to intelligently communicate with the right career communities.. Gone is the age where email campaigns stay unread in students’ inboxes. Ensure your team’s in the know with admin tools that keep you on the same page with students. To stay engaged, students today require content to be relevant. By utilizing custom-made student categories, you can target your communications to the right student groups. Get key insights into student engagement patterns and adapt your outreach strategy in real-time. With our analytics, you’ll get the full picture and never be in the dark again. Adapt your app in real-time to ensure that your content stays up to date. Our content management system gives you the ability to have full control over your student-facing resources.